Shares in Cambridge-based UK chip designer ARM rose more than 11% after the announcement on Friday of a licensing agreement with Microsoft. The agreement extends a collaboration between ARM and Microsoft on software and devices for the embedded, consumer and mobile markets. The two companies have worked together since 1997. The latest deal, which gives Microsoft access to Arm's core architecture, is thought to signal Arm's long-awaited breakthrough into the computer market, according to the Financial Times. ARM's share price was further buoyed by speculation that Microsoft, which has designed its products around the chip architecture of Intel, will port Windows to work on ARM architecture. Analysts also said Microsoft may develop its own applications processing chip for mobile devices and games consoles as Apple has done with the A4 chip used in the iPad and iPhone 4. 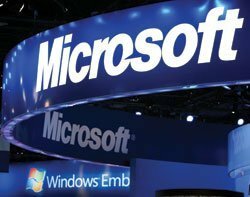 Microsoft is keen to strengthen its position in the mobile market as it prepares to launch its Phone 7 mobile operating system in August in the face of stiff competition from Android and iPhone.